Payload build-up is underway in French Guiana for Arianespace's medium-lift Soyuz mission this week, which is to orbit the SES-15 telecommunications satellite for European-based operator SES. SES-15 is lowered into position atop the Soyuz Fregat upper stage during payload build-up activity in the Spaceport’s S3B clean room facility. 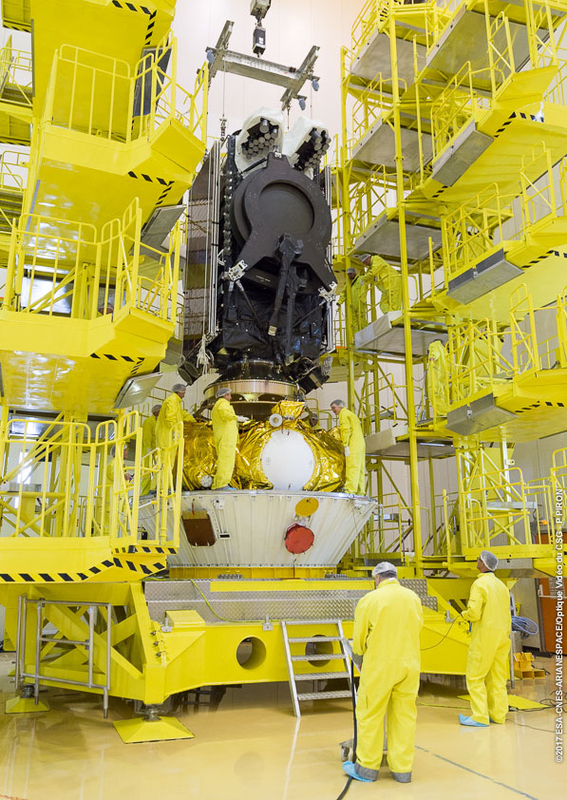 These preparations – performed inside the Spaceport’s S3B clean room facility – involved the installation of SES-15 atop Soyuz’ Fregat upper stage, enabling its encapsulation in the two-piece protective payload fairing. The completed unit, called the “upper composite,” will be mated atop Soyuz after the vehicle’s rollout from the MIK integration building – where launcher assembly is handled – to the ELS launch zone. Scheduled for liftoff on May 18 at precisely 8:54:53 a.m. local time in French Guiana, Soyuz will carry out a 5-hr., 18-min. mission from launch to SES-15’s separation into a sub-geostationary transfer orbit. Fregat – which is responsible for the final orbital maneuvers – will perform two burns separated by a four-hour-plus ballistic phase to reach the targeted deployment point. SES-15 will be the 40th spacecraft orbited by Arianespace for SES, and its launch marks this long-time customer’s first use of Soyuz from French Guiana. The Boeing-built satellite has an estimated liftoff mass of 2,302 kg., with the mission’s total lift performance set at 2,447 kg. – taking into account the payload integration equipment and other hardware. Arianespace’s May 18 mission, designated Flight VS17 in the company’s numbering system, will be the second-ever launch to geostationary transfer orbit performed by Soyuz from Europe’s Spaceport in French Guiana. The first was conducted earlier this year, with the Hispasat 36W-1 satellite successfully deployed on January 27.